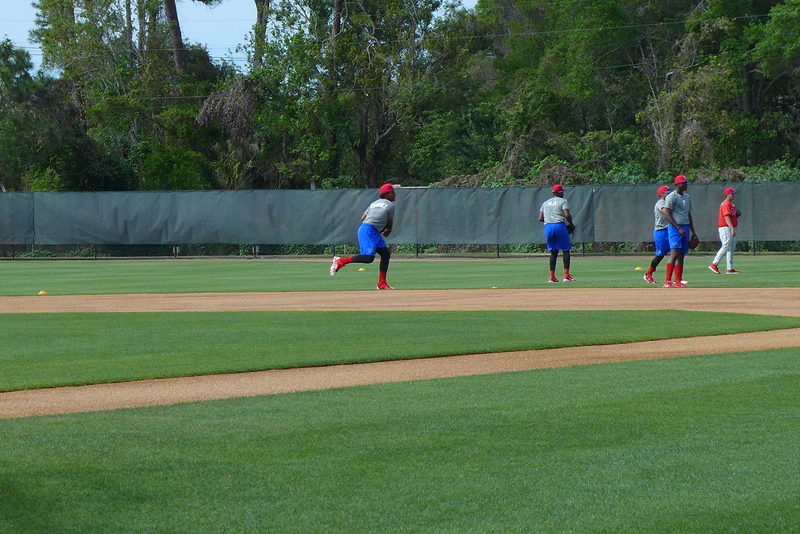 The Phillies played a home game Friday and two split squad games Saturday. Both days, they sent players over to the Complex to work out. Friday’s group consisted of the players who weren’t scheduled to play in the game. They stretched, tossed and took batting practice. As I entered the Complex on Saturday, two buses departed for Bradenton. 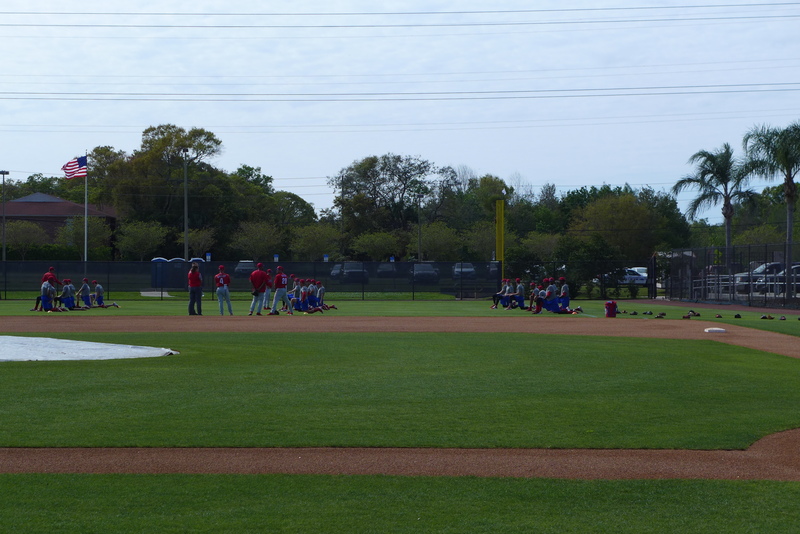 Soon, the players who remained in Clearwater came out on Ashburn Field to work out. The players taking BP were those in the home line up. While this was going on, the minor leaguers were taking their physicals and attending meetings. Position players were dismissed early on Friday and pitchers took to the fields around 2:00 PM. They separated into four groups, one on each field. Saturday, the pitchers were released early. 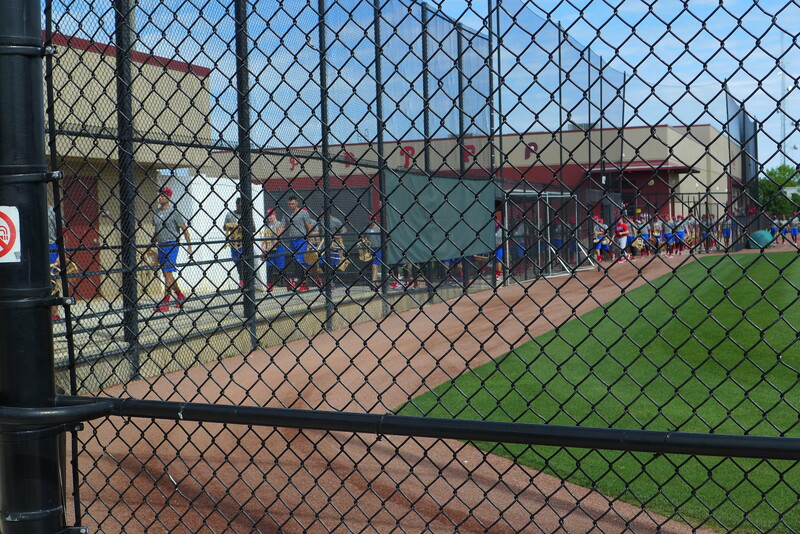 The position players came out around 1:00 PM and broke into four groups, one on each field. Each group is run by the coaching staff of one of the affiliates. There are a lot of new faces, so I look for identifiable faces to help identify the staff. The group is identified by this coaching assignment. The assignment of players to the group helps support these observations. Group One (on Roberts Field) was run by the Reading staff. Group Two (on Carlton Field) was run by Clearwater staff. Group Three (on Ashburn Field) was run by Lakewood staff. Group Four (on Schmidts Field) was run by the Williamsport and GCL staffs. There are very few DSL guys here. I’m sure more will be invited for XST in 4-6 weeks. Hopefully, they will have work group handouts early next week. Until they do, I’ll continue to update my observations. The pitchers just stretched and tossed. They looked bored as they incorporated pick off moves into their short-toss. The position players stretched and tossed, but also ran some fielding drills while taking batting practice. Now, remember this is BP off a coach from 40 feet although a hard thrown ball from that distance might seem like an 80-something pitch. Some of these guys really crushed some long balls. Cord Sandberg must have hit ten over the RF fence on Roberts. Over on Ashburn, I watched Nieporte, Stobbe, Ortiz, and Mayer pelt balls off the Spectrum Field wall. Stobbe hit one high off the wall, about ten feet left of the kids play area in Spectrum Field. Game notes: Deivy Grullon got a pinch hit single and RBI in the Orioles game, JoJo Romero struck out a batter in one-third of an inning but left with the bases loaded. (Taveras put out the fire.) In Bradenton, Zack Coppola and Luke Williams struck out and Zach Green flew out. Thanks for the information, Jim. I was kind of wondering how the minor league rosters would play out, and at least this gives an early indication. Have to assume Luis Encarnacion and Jose Pujols may be repeating and close to elimination after this season if efforts still come up short. Looking for catcher Deivi Grullon in group one or two….not showing. I assume two bad signings. I am wonder Romus. besides the marlins. Who is worse than the phillies>??? rocco….what is surprising is that both Encarnacoion ($1M) and Pujols (>$500K) were just two high of bonuses to have such resultant collapses. Then you see Robles of the Nats, Acuna of the Braves with realtively low bonus numbers $100K, like Franco. pitchers , so far, have been the best signings for the buck…Sixto at $16K, Kilome @$40K and the others were relatuively inexpensive signings. I Think its tough too judge 15 yr old kids. Especially with completion. language barrier. Maybe signing more at less money is better then a couple at big money. I don’t know , but its not easy to judge these kids. The starting pitching for both Lehigh and Reading should be top notch this season. It leads me to wonder how long of a leash Velasquez will have this year. 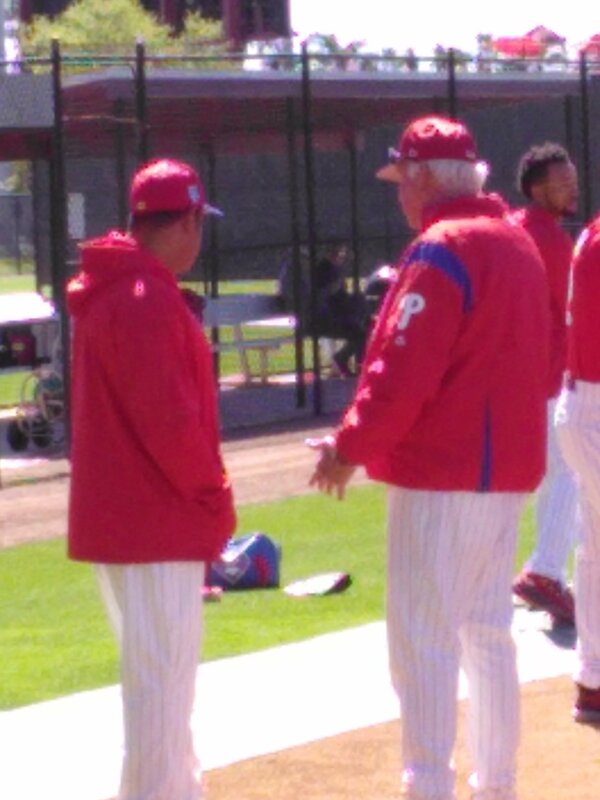 Will the Phillies be in a position where they have to save Leiter today because Velasquez is pitching tomorrow? The idea of Quinn being the fourth or fifth outfielder is that less playing time will reduce his chances for injury. Shouldn’t the same thought process be used for Velasquez? I don’t have a crystal ball, and can’t guess how effective Velasquez will be as a reliever, but his chances for success are better in the pen. Looks like Adam Haseley is scheduled to start the year in Reading with Cornelius Randolph. Have to assume this means Mickey Moniak will begin 2018 in Clearwater with Danirl Brito, Arquimedes Gamboa, Darik Hall, and Jake Scheiner. Hinkie….you still can have the annual trickle down effect when the major league camp starts to make their cuts and some of the current group players get push down a peg. True, Romus BUT the higher ranked prospects should be made room for. Yes…that is waht i am saying….if Kingery is sent down…..he pushes a group one infielder now on the above list, like perhaps Gomez, down to Reading. Haseley will be in Clearwater. Lots of guys in big league camp still have to come down. Looking forward to seeing Ortiz in Lakewood. I hope they double bump Muzziotti up to join him, that’d be an exciting outfield pairing. Matt Gelb says Kingery could crack the opening day lineup. Kapler likes his versatility. I personally would prefer him stay at 2b but until Cesar is moved, but a Zobrist type role wouldn’t phase him. Kid’s a stone stud winner. I get the service time thing but come on already. True young talent should get paid early on in their career if owners won’t (understandably) pay for past performance, with which I agree, but let’s not have it both ways. If the Phillies had playoff aspirations this year, I’d be pissed that Kingery starts in the minors. But we are not. And it’s not like we’re running out a stop gap until he gets called up. The kid played centerfield and second base in college. Those are two positions we have currently filled. Let’s get that other year of control locked up. Owners and players and pay checks are none of our business. They all negotiated and agreed on the system as it stands. So let’s take advantage of it… But my solutions? Raise minimum pay to $1M, let them get to arbitration one year sooner, and let them get to free agency one year sooner.